Slated for release October 20, 2015. 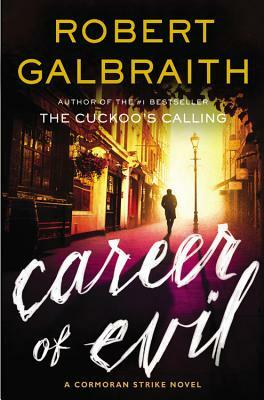 To celebrate Robert Galbraith’s (aka.JK Rowling) upcoming new mystery title, in the ongoing detective saga of Detective Cormoran Strike series, Career of Evil, we are going to feature a very fun contest, and you can find all the rules right below this little introductory bit. But know that a prize has not been finalized yet, but there will be one, I just haven’t gotten any needed resources just yet for any such contests. It is definitely in the plans,though, so don’t be dismayed I have nothing specific to provide just yet. Anyways, this contest has everything to do with Twitter. If you, as eitther a huge Harry Potter or Detective Cormoran Strike fan, have yet to venture to JK Rowling’s brash Twitter page, be sure to check it out. It is every bit as smart, incisive, insightful, and acerbic, as you’d expect the author of a series like Harry Potter to be. Click the image above of JK Rowling, to check out her awesome Twitter Page. To enter to win: Please send any and all tweets you can think of by using the following hashtag #BibliophilesReverie and be sure to add @jk_rowling within all these tweets, so they’re theoretically being seen then by JK Rowling herself. See, the main objective of this contest is to say something that you feel is clever, or potentially worthy of gaining JK Rowling’s attention. Essentially, the first person to attain the attention of the elusive JK Rowling over Twitter, whether through a retweet, favorite, or perhaps a reply, will win the ultra-secret, unannounced prize, but they will be deemed the winner of something special, perhaps a free copy of a book of some kind (hopefully Cormoran Strike related). The contest ends if someone get JK Rowling to reply to their tweet, and the winner is then automatically deemed. If not, the first person by October 31,2015 at 11:59 PM. Eastern Standard Time to have had the tweet favorited/retweeted will be the winner. If no one by this date has gained JK Rowling’s attention over Twitter, then the winner will be chosen at random, since I feel it’s only worth rewarding everyone either way for their effort and enthusiasm. ** Sadly, the contest is only open to those living in the United States, due to the high costs associated with international mail, though I really wish to include more contests, eventually, that are open to a worldwide audience, particularly ones in which Ebooks are the reward. While you’re awaiting the highly-anticpated new Detective Comoran Strike book on October 20,2015, we will be featuring two reviews of Robert Galbraith’s mystery novels, beginning this Monday, so be sure to remain up-to-date with all the posts we have planned in bated anticipation over the third entry in the series, Career of Evil.